The books help me assess a child's development - I watch how they look at it, how they pick it up, what they do with it, how they manipulate the pages, and as they get older, what they say about it. This also helps me teach caregivers about their children's abilities to see, hear, and understand. There was one little girl, Michelle, who's mother informed me that Michelle's dad made a special shelf for the Reach Out and Read books, and that she continues to look at all of her books, even the baby books, which are now quite worn. Joslyn absolutely loves to read. She has great problem solving skills, a good grasp of cause and effect, and is in the highest reading group in her kindergarten class. We read at home almost every day and Joslyn has exceeded all expectations of entering kindergarten with exceptional literacy skills. 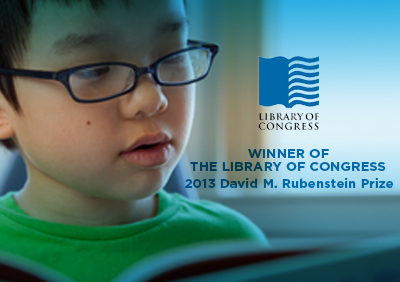 Reach out and Read is a great program because children need to learn to use their imaginations and dream big. I believe that reading to my daughter since she was a baby gave her a jump start on learning how to read. Thank you Reach Out and Read Kansas City for allowing her to have the experience! One of my most special ROR memories involves handing a book to a 6-month-old patient sitting on his mom's lap. Usually babies at that age start to chew on the book while holding it upside down and backwards, but this little guy took it from me with both hands, held it in the correct position, and opened it all by himself. He proceeded to scan each page from left to right and then actually turned the page on his own! He clearly had been read to many times. He was very serious and business-like in his approach, but as soon as his mom engaged by pointing something out, he broke into a big smile - and of course his mom and I did too! Every time I read to the children was a positive experience. The children were so welcoming and happy to be read to. I love seeing their excitement when they got to pick out their own book, found out they could take one home, and when the older ones took the chance to read to their siblings or other younger kids around them. Since many of the children I only see once, and the group of children varies each day, the bonding and relationship you have with them is very short, however, the reading experience and reminding them how much fun reading is, lasts much longer... and that's why I enjoy volunteering for this program! I worked in Research at KU Medical Center and was able to walk over during the day once a week and read for an hour. It was wonderful being able to read to the children while they were waiting to see the doctor. Some parents were already very involved in reading to their children but others saw the example of how to share books with their children. It was a very rewarding experience working with a great program which is run well. One time, I was sitting in my regular space at the clinic when a family walked in and the boys yelled, "the book lady is here!" I had been there on one of their previous visits and the mom said that the boys always look for me when they come. Heartwarming! Once I had a young boy make up a story to go with the pictures of a book. He did this several times, and made a new story every time. It was wonderful to let him explore his imagination and hear what he created. A shy child would not read at first, but then after watching the other children read with me, the timid boy sat down with us and listened to the story, and eventually became active in answering questions pertaining to the book. It's the highlight of my day when I see a child get excited about a book they recognize and they read it to me! Depending on the child's age, I ask if they want to read to me or let me read to them. Most of the time it's the latter but when they read to me, it's delightful. They're excited, the parents are proud and it's a positive experience for all of us. I have enjoyed working with Reach Out and Read the last 6 years and wish you all the best of luck in the years ahead. The program is amazing!! Please allow me to brag a little about my daughters-My third grader is reading at an 8th grade level and my first grader is reading at around 3rd to 4th grade level!!! I really am blessed to have learned about the ROR program early on. I don't think my girls would be reading at the levels they are now had it not been for the program. 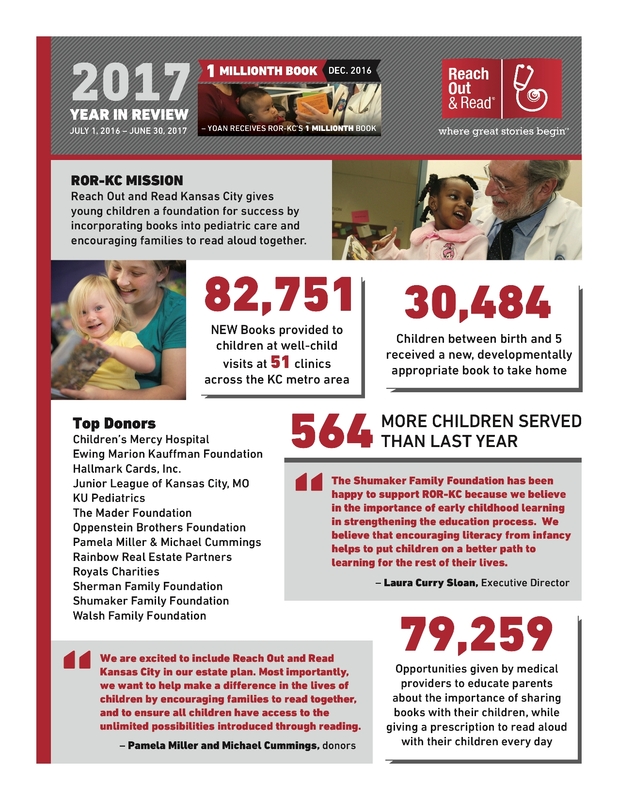 Reach Out and Read Kansas City experienced positive growth and success during the 2016 program year. Click to enlarge our 2017 Year in Review. Check out our 2015 Annual Report and 2016 Annual Report too. 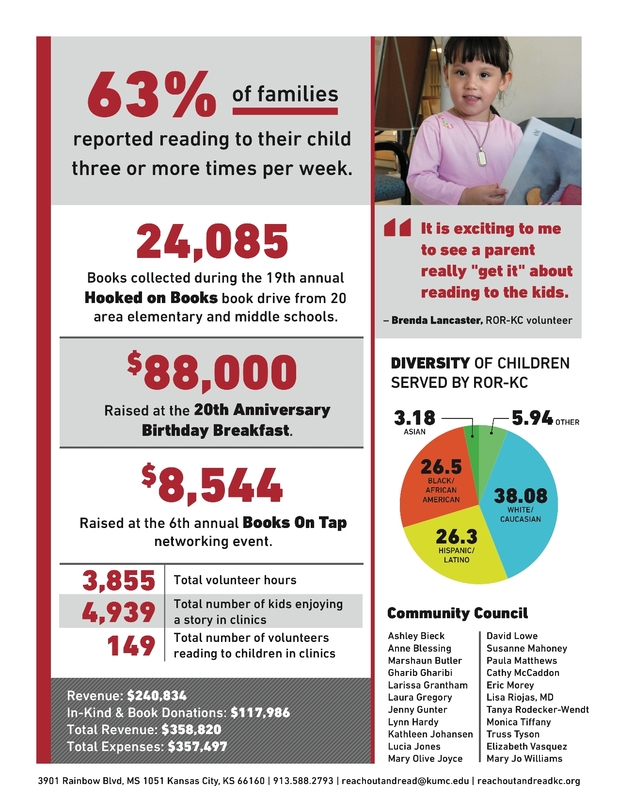 Reach Out and Read Kansas City reached a huge milestone Friday just ahead of the program's 20th Anniversary. A year ago, as Sister Berta Sailer watched tearful parents on television wait for their children to walk from a Connecticut school alive, one thought went through her mind. She has put it in words many times since: "If we want to show our kids they are in a safe world, we need to show them there are more good people than bad people." Sailer, co-founder of Operation Breakthrough, has helped do just that since the tragedy. Days after the shooting, Sailer threw down a challenge to the people of the Kansas City area. Children's language ability improves with increased exposure to Reach Out and Read. In the Kansas City area, 66% of parents of children 6 months to 5 years old reported reading to their child 3 or more times per week and 100% of this group said they will share books either as frequently or more, based on the advice they received that day. What distinguishes Reach Out and Read from other interventions is its large and growing evidence base. 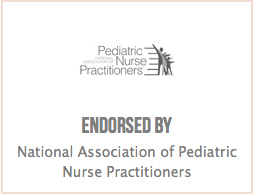 Since 1991, the Reach Out and Read model has been studied by academic investigators in a variety of settings, providing an extensive body of peer-reviewed research on the effects of the program. 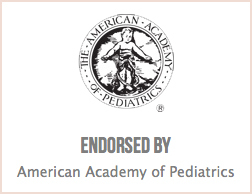 The body of published research supporting the efficacy of the Reach Out and Read model is more extensive than for any other psychosocial intervention in general pediatrics. Review the research findings here. More information can be found on the National Reach Out and Read website.